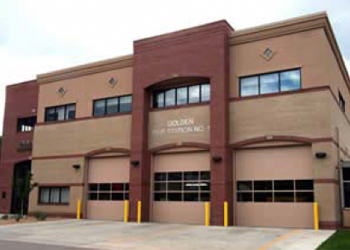 Project Description: The Golden Fire Station No. 1 is a two-story 14,660 SF facility which contains a six-bay apparatus garage, watch office and ancillary functions on the main level. The second level contains administrative offices, a training facility and 4-bedroom quarters area. The station replaced the existing facility which was constructed in 1961. This was an urban site which was limited by many existing constraints for new development.